12 weeks of progressive strength and hypertrophy training. Suitable for intermediate or advanced lifters and perfect as a progression after The Muscle Onramp 12 week plan. 16 different workouts in total across three week micro cycles. Nutritional guidance provided via 'The Nutrition Fix' - a comprehensive guide of how to optimise your diet to fit your goals. Named after the Greek god of the sun. This is the go-to plan to define a physique for a season in the sun. How many workouts all together? Over the course of 12 weeks, there will be 4 microcycles; each containing 4 workouts. These are rotated over 3 weeks, so in total there are 16 different workouts. They usually start with one full body strength session, with lower reps and higher weights which will challenge your strength. The rest of the week with be split into 3 hypertrophy sessions orientated to gaining muscle. Split into one lower body, one upperbody vertical and one upperbody horizontal. If all that is jargon – then basically all you need to know is it’s incredibly varied and designed to hit all the muscle groups without you having to think. An idea of one of the Apollo microcycles and how the app tracks your workout with fantastic videos, descriptions and clear measuring and set rest times. How much investment time wise? The goal would be to complete all 4 sessions in a week. However, we know life gets in the way, so if you can only manage 3 then this is still great (just make sure you don’t always miss the last session of the week – keep then rotating!) If you are used to doing more, then there is space for your own personal sessions and you can track these in the app too. At the end of the day, it’s about your own goals, but the program is built to be achievable with most sessions lasting an hour. One of the fundamentals of any successful muscle building programs is what known as progressive overload. This is where a training plan and exercises progress either by weight or volume lifted in small increments over time. Muscle onramp is designed in this way and with the PR1MEBODY app (designed to track your workouts), it’s very easy to progress your weights incrementally because it shows you on the exercise how much and how many you performed the time before. Apollo also works by progressively overloading the workouts by methods of exercise complexity and variety, rep ranges and a number of other nifty tricks which you'll experience across the 16 weeks. The Apollo plan comes with The Calorie Fix loaded into your Profile hub within the App. The Calorie fix is a step by step guide that shows you how to establish first a calorie baseline, and then how to manipulate your calorie intake to help facilitate your training goals whether it be muscle gain or leaning up while maintaining as much muscle as possible. More comprehensive nutrition guidance for fat-loss can be found in the Foundation programs ‘Balance’ and 'Fast-track’. For more information on these click here. What kind of gym equipment is needed? A well-equipped gym is preferable, but there are always ways to complete the training programs. 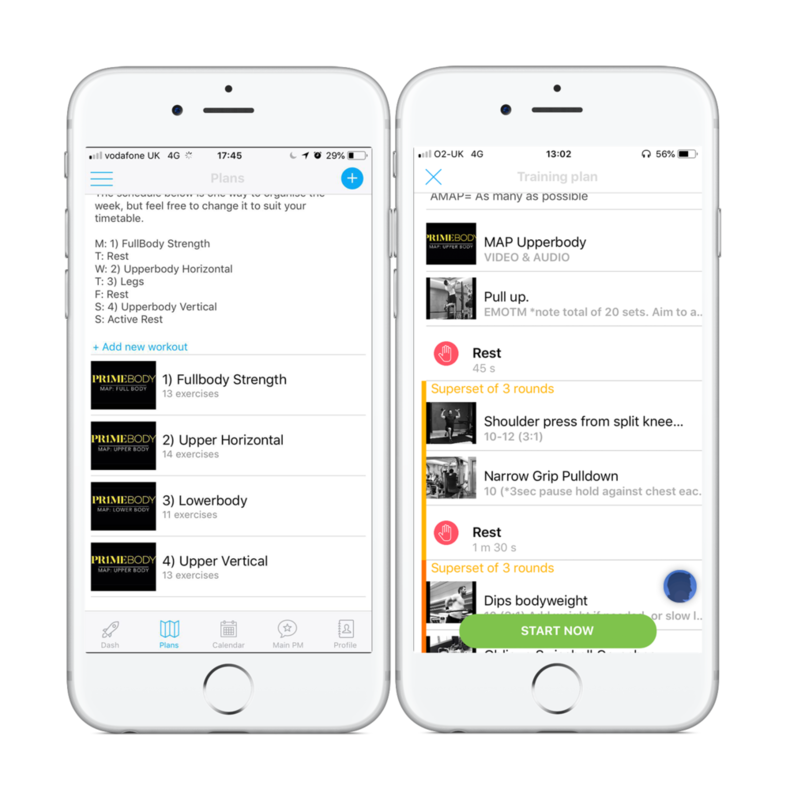 The app shows you videos and descriptions of all exercises to remove barriers if you are unsure about how to perform them. Built into the app and each training program is alternative exercises for back-ups (for example when it might be too busy or you want to perform the exercise in a different way) or for less equipped gyms. The programs are designed with 'normal' gyms in mind and nothing too out there is included. Firstly, the app has a chat function built in so you can chat to Tim directly there. On the Facebook community is a plethora of additional information, work out tips, Q&A’s and recipe ideas. Tim’s Instagram is a great resource of exercise technique too.